A veritable feast – and nearly free if you catch your own fish. Nature’s grocery store is really kicking into high gear right now. Besides the posts I have written about recently, yesterday I saw curly dock, ground-elder and garlic mustard coming up in abundance. The latter two are starting to menace my gardens right now. One might even call them my backyard foes. I'll be foraging of those enemies soon. 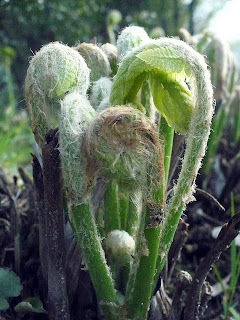 Besides the three above, there is another little sweetheart that is making an appearance right now, not only in nature, but also in our grocery stores: fiddleheads. Fiddleheads, also known as ostrich ferns (Matteuccia struthiopteris), grow wild in wet areas of northeast North America in spring. 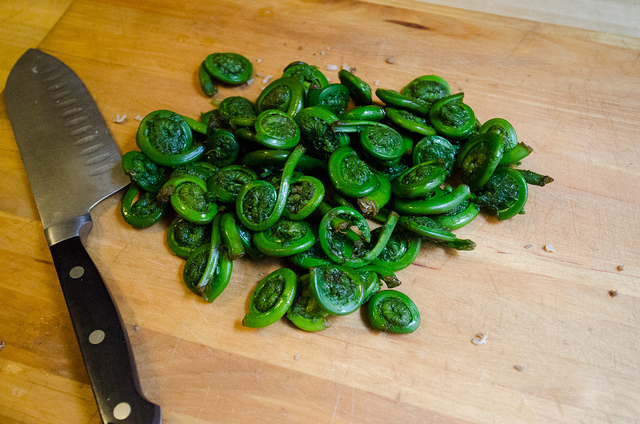 Fiddleheads are a traditional dish in Maine (USA), and Quebec and the Maritime provinces of Canada. Tide Head, New Brunswick, bills itself as the "Fiddlehead Capital of the World." 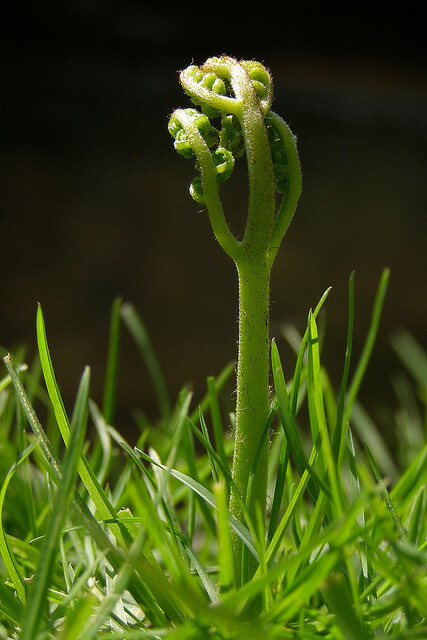 The Mi’kmaq and Maliseet natives considered fiddleheads to be medicinal as well as a food. They were an early season staple for them after the long, bleak winter. When you buy fiddleheads they are bright green. When foraging they are covered in a brown fuzz that has to be removed before eating. I have read the best way to do that is with your fingers under running water. Try your best, and then boil them for 15 minutes with a change of water in the middle. Fiddleheads must be cooked before eating. They usually occured within 30 minutes to 12 hours after consumption. Symptoms typically lasted less than 24 hours, but it was found that in some cases it stayed around for up to three days. Many ferns contain the enzyme thiaminase, which breaks down thiamine. That's highly undesirable. This can lead to beriberi and other vitamin B complex deficiencies if consumed to excess or if your diet is lacking in these vitamins. I’ m assuming that excessive consumption would be a few times a week. If you haven’t been turned completely off yet, fiddleheads are available in the grocery for only a few weeks in springtime, and are not inexpensive. Pickled and frozen fiddleheads can be found in some gourmet shops (and some groceries) year-round. Humans have been eating them for millenia. Just use some common sense. Two important tips: don't eat them raw, and don't forage from polluted areas. Fiddleheads contain various vitamins and minerals, as well as omega-3 and omega-6 fatty acids. They are a source of antioxidants and dietary fibre. They are low in sodium, but rich in potassium, which may make them suitable for people who need a low-sodium diet. You have to watch what you pick, though. Many spring ferns are nick-named “fiddleheads” but are NOT the ostrich fern. For example, bracken (Pteridium genus), are carcinogenic. These also grow everywhere but are easily separated from fiddleheads because they grow singly as opposed to in a clump. This is bracken. Don't eat it. Sounds excessively decadent, doesn't it? Well it sort of is, but it's also unbelievably easy. I have poached fish completely in butter, but this time I opted for 50/50 butter and wine with some peppercorns and onion thrown in for good measure. Reduce the poaching liquid to a sauce and top the fish and fiddleheads. It's stunning on both. 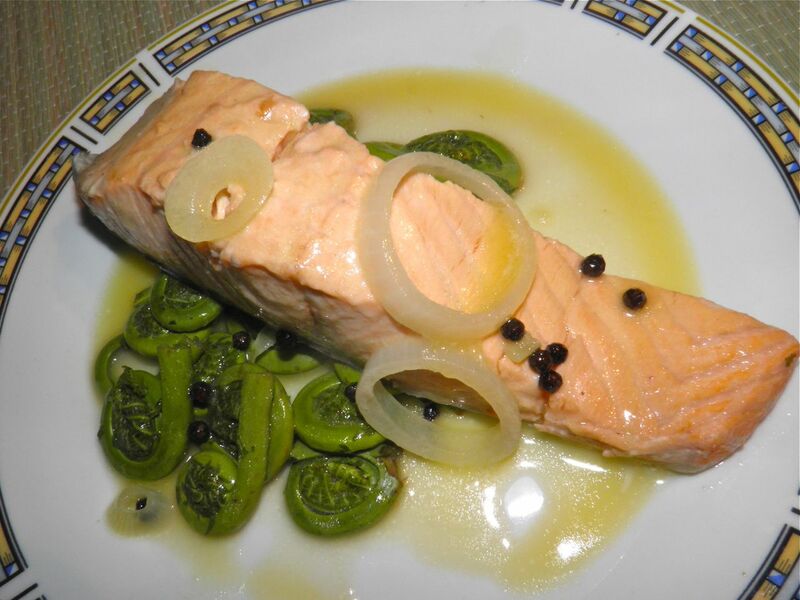 For a truly springtime feast, pair fiddleheads with fresh-caught brook trout. I do my best fishing at the grocery store, but the day I made this they didn’t have any trout. Salmon was on sale so I had to make do… poor me. The following recipe is a stunning way to prepare salmon or many other fish, regardless if you serve with fiddleheads or not. Melt the butter in a saucepan with a wide enough bottom to hold the fish in one layer without much additional room. Meanwhile, trim the fiddleheads, clean and rinse well and place in salted water. Bring to a boil and let cook for 15 minutes,changing the water halfway through. Then drain. 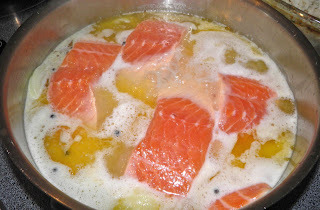 Continuing with the salmon, add the peppercorns and onion to the butter and let sauté for about 2 minutes. Partially cover and let simmer on medium high for 10 minutes. Remove the salmon and increase the heat under the pan to high. Let the sauce cook down until almost all of the wine has evaporated. To serve, divide the fiddleheads onto individual plates. Top with a piece of salmon and drizzle with the reduced sauce, onions and peppercorns. Sprinkle the fish with a little Celtic sea salt. Oh my god that looks good!